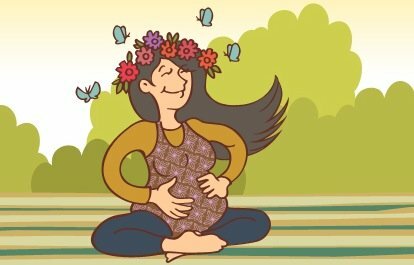 In a way this last post in my series on how to induce labour naturally we will look at spiritual ways to induce labour and it is both the shortest and yet has the most effective methods! As we have seen with physical ways to start labour, all the things you can consume to help labour commence, and all the different therapies you can try, they often have dubious efficacy and can sometimes cause nasty side effects. All of the methods outlined below have no adverse side effects. 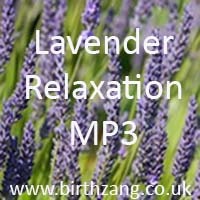 Never something to underestimate, relaxation is a very powerful spiritual way to induce labour. Or to look at it another way, being tense and anxious is never going to help you go into labour because its onset is controlled by our old friend, Oxytocin. The release of oxytocin is actually reduced or even stopped by the presence of adrenaline which is released when you are tense and afraid. Easier said than done, especially if you are desperately trying to avoid a medical induction, however you can find many ways to relax: listening to music, having a happy meal with friends, watching a good Movie, going to bed, having a soak in a (not too hot) bath, going for a walk in a beautiful place – let’s face it, how to relax is a very personal thing. Probably efficacy: good. Once you have got over the anxiety about being overdue, you just might find things start to happen on their own, and many relaxing spiritual activities will also stimulate oxytocin as well, sometimes referred to as the “love hormone”. Take 16 minutes to just breathe and relax with this soothing guided relaxation or meditation. Perfect for you…or your baby. I do believe in the power of thought but not I am not completely convinced that visualising birth is going to make a blind bit of difference! Probable efficacy: poor. 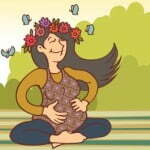 But it is never going to hurt and having a positive outlook on birth is always going to help. Probably efficacy: poor. But again you can never have too many positive stimuli and who is to say it doesn’t work? This comes under a similar umbrella than visualisation and relaxation, in many ways, but some meditation includes a visualisation and some just tries to help you focus on just being. Quite a personal thing again and will be more effective if you are practised. True meditation takes A LOT of practice but if it is something you have in your life then it will really help you focus and relax. Labour is very much about letting your body take over so being able to get “in the zone” of your own mind and focus inwards will help you enormously in having a spiritual labour, and may well help get things started. Probably efficacy: medium. Depends on your previous experience. Will certainly help you approach labour with calm and strength. A very Wise Woman  who taught me the Seven Secrets to a Joyful Birth once told me a wonderful story about a woman she was a doula for, who was going really overdue. She had a chat with the lady about how she was feeling and the lady was in a bit of a state. It was her 4th (and last) child and she always had had a fantasy about having a beautiful home birth in front of a lit log burner and this was her last chance. But her husband had still not managed to install the log burner and she was feeling upset about missing out on this fantasy. The wise woman – Dominique Sakoilsky – suggested she make her husband install said log burner immediately. He did that evening, and she went into labour the next day and had a beautiful home birth in front of the log burner. Now I am not suggesting you install a log burner (oh, if it were only that easy!) but that many people have things that are psychologically “holding them back”. Not fear so much as not being quite ready. Probably efficacy: medium. Finish painting the nursery, get to the bottom of your ironing basket, take your shoes to be fixed, build the cot, get the car serviced. Whatever it is, get it done, sit down and relax! This is a popular exercise in Hypnobirthing classes . In a way related to installing your log burner, if you have unspoken fears about your pregnancy, labour, birth or parenthood journey then the adrenaline produced by that fear can inhibit oxytocin considerably. Sit down with your partner or a close friend, list every single fear – no matter how trivial – and talk it through. talk about what it is you are afraid of, how it makes you feel, and then talk about what you might do if it happened. If it helps write a plan of action for that scenario. Then write each fear down on a piece of paper and burn it in your log burner. Can also be done as a visualisation. Probably efficacy: good. Fear is a huge inhibitor and can be a significant barrier to labour starting. Admitting your fears and overcoming them, embracing them and then releasing them is more powerful than you can possibly imagine. This is the sure fire 100% guaranteed method that we have all been waiting for: PATIENCE!!!! Oh, it is excruciating, especially if there are valid medical reasons for requiring an induction after a certain time, so the pressure is really on. All the methods in all four posts will help to pass the time but just knowing that 70% of babies do arrive within 10 days of their due date should help you to stop fixating on the “due date” bit and start focussing on the “estimated” bit. No-one has ever been pregnant and not had their baby! You can opt for daily monitoring once you hit 42 weeks if you are concerned about risks, and try any or all of these methods but waiting is actually what you really have to do!